YSTL, which celebrated its second birthday in June, has named many accomplishments within the past year. Focusing on higher education issues, the organization launched its student debt campaign in the fall of 2012. The campaign began with a student debt conference in which Missourians of all generations gathered to talk about student debt, tuition hikes, and financial literacy in schools. 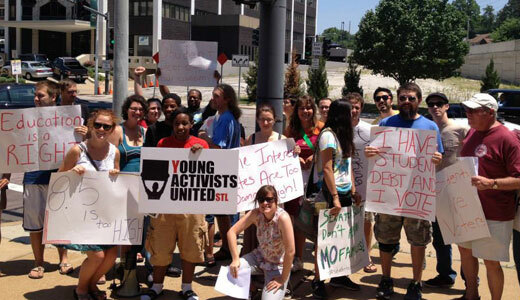 Subsequently, YSTL organized several actions around student debt. YSTL has also given students a platform to talk about their personal experiences with higher education issues. In 2013 member Emily Koehler, accompanied by members of the United States Student Association, attended a meeting with Sallie Mae CEOs and Executives to present demands about improving conditions for student borrowers.